The Original idea for round the world travel has been sitting with me for over thirty years. I never before mentioned, even to Claudette (my wife) or my closest friend why I had this crazy desire in the first place. In about grade four, our school library had a huge coffee table book. 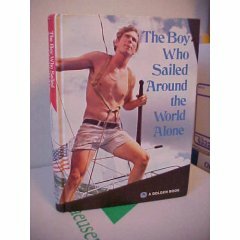 It was called The Boy Who Sailed Around the World, Alone by Robin Lee Graham. It was a fantastic (albeit brief) story with beautiful big color pictures on every large page. He started out at about age sixteen and took a few years to sail around the world. I was somewhat interested in sailing after reading this but even more, I was struck with the thought of seeing the world. Thus my thoughts of traveling to exotic places for the next decade were coupled with thoughts of how I could could possibly become a millionaire. The logic was sound (at that age) since surely only a millionaire could possibly afford to take a few months and travel all around the world. Today I certainly know different. There are an abundance of websites dedicated to helping the non-upper class citizens of the world attain the goal of traveling. Most have very good ideas on saving including the top two; STOP eating out except for special occasions and STOP buying fancy coffee. The next logical (but oft unmentioned) step is to take those daily amounts of money you have saved and plunk it directly into a SEPARATE savings account every two weeks. Many Western people that we got to talking to at various places were typically on a two week vacation visiting that place. When they asked about our trip, or why the kids were out of school, we would then (calmly, and without arrogance) explain the extent of our trip. Nine times out of ten the response would be, WOW! Aren’t you guys lucky!. Well, in fact we weren’t lucky at all. We worked dam hard to plan for and save for such an extensive trip. There was no luck involved in the slightest bit (except for perhaps being born in one of the few countries of the world where people are allowed to actually leave the country to visit other places). The first few months of such a reaction would make me uneasy and I would invariably change the subject. After a while though, I began to (gently) let my offense be known. I don’t think I convinced very many of those people though, that such an immense goal was not unobtainable for most regular people, even them included. It became very frustrating to me that people could remain so completely closed minded to the possibilities in their lives, even with the hard evidence of my family and our experience staring them in the face. As far as Graham’s book goes, I bought it recently. I looked it up on amazon, but it’s been out of print for quite a while. Luckily, with their used marketplace I was able to track down a copy for not a bad price and ordered it. I had it sent to the Potter’s house in Saskatchewan, where we planned on stopping. Unfortunately, it didn’t arrive in time for me to get it there and show it to friends and family we plan to visit with for the remainder of our journey. Instead, Dale will forward it to us in Edmonton. In the meantime write and tell me what I can do to help inspire you! For it is a simple endeavor and merely requires a firm commitment and some focus to the final goal after that. Honestly, it’s easy!